Why it is interesting: In this invention flexible foams containing superabsorbent polymers, fertilizers , (preferably) a (biodegradable) fiber reinforcement and plant seeds is described. It was found that the temperature of the foaming mixture must not exceed 80°C for the seeds to survive. The temperature can be controlled by prepolymerization, sec. OH content of the polyol and thickness of the foamed part or slab. 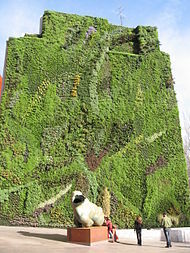 The flexible foam sheets can be used for green walls, roofs and the like. Foaming plant seeds in flexible foam has been done before using ‘Hypol(TM)’ technology. The temperature is then kept low by using a ‘full’ prepolymer and a large surplus of water. See my blogpost on Hypol and US3812619.